Sometimes people don’t treat the foundation, basement, or crawlspace as part of the home and neglect to prepare it for winter. Whether you think of it as such or not, it is part of your home and you need to winterize your foundation. Basically, foundation waterproofing and winterizing is prevention: preventing water intrusion, cracks, and pest infestations during the cold, wet months still ahead of us. 1. The landscaping around the perimeter of your foundation should be clear and allow for downhill slope for water runoff to drain away from the foundation walls. Clear all the weeds, vegetation, or soil buildup and create a clean, gradual slope. 2. Make sure gutters and downspouts are clean and in good working condition. The downspouts should end at least six feet away from the base of your home. Flexible piping works well to route water to designated areas or drain fields. There are also underground discharge lines or French drains. Whatever system you have make sure that it diverts water away from your foundation wall and is in good working condition. Allowing water to dump directly next to your foundation wall will cause problems now and in the future and could lead to serious structural damage to your entire house. 3. Inspect your foundation for cracks. While not all cracks are signs of structural damage, every crack could let in water, bugs, rodents, or harmful soil gases. 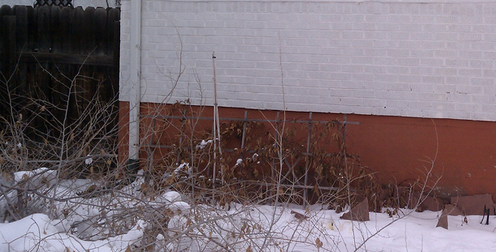 The freeze-thaw cycle of the winter months may make these cracks worse. Concrete naturally expands and contracts with the temperature changes and naturally cracks from this movement. It is best to get any foundation crack looked at by a professional foundation repair contractor and fixed with crack injection material. 4. Watch for standing water, active leaks, or water stains. These are signs there is a water problem in your basement or crawlspace. While the winter months equal more moisture, rain and snow, don’t wait for spring to get these leaks fixed. The best bet is to fix the leaks now so in when the snow melts in the spring it doesn’t fill your basement or crawlspace. The best option for a crawlspace is to professionally seal and close it year-round; however, if you still have a vented crawlspace make sure the vents are closed in the winter. There are several different vent cover options available until you can professional encapsulate the crawlspace. Insulated closed crawlspaces are actually more efficient and limit the heat loss through the foundation walls. Check window wells and basement windows to make sure they are sealed. Basement windows are the most common spot water enters a basement. Remember, winterizing is about prevention. The more you can do to your basement or crawlspace to prevent future problems the better. Do what you can now to prevent water or pests from entering your home through your foundation walls, basements or crawlspaces.